Using lengths of floss and tape is the traditional method of cleaning between teeth and along the gum line and is ideal for smaller gaps between teeth. Cleaning between teeth is essential in maintaining healthy teeth and gums and flossing is ideal for smaller gaps between teeth. As well as effectively removing plaque from between teeth and below the gum line the thin nature of these products also means that they pass and clean between the tooth contact points and will help prevent caries. However many people find using floss difficult, time consuming and sometimes painful so below we offer tips on how to make flossing simpler so you can make it a regular part of your oral care regime . • 1. Wind the floss around the middle fingers of each hand and hold it tight leaving a gap of about 3 inches / 8 cm. • 2. 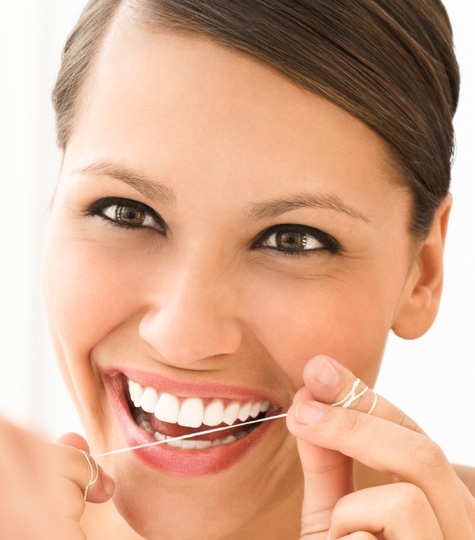 Gently glide the floss between your teeth and towards your gum line. Run carefully up and down the side of each tooth, taking care to clean under the gum line to dislodge food and plaque. An alternative to flossing with lengths of floss is to use a floss ‘harp’ device. These are rigid plastic products that have a length of floss built in that can be easily manoeuvred around the mouth and then disposed of after use. These can make flossing a much quicker process and make reaching the back teeth much easier than when using traditional floss. As with traditional floss they should also be used gently and should never be forced between teeth so to avoid gum damage. • Wisdom Easy Floss – A long handled flosser with disposable floss harps that makes reaching the back teeth incredibly easy. • Wisdom Easy Slide flossers – A disposable harp design but incorporating a softer PTFE flossing ribbon for excellent gentle cleaning. Ideal for people with delicate gums. When using any flossing product for the first time you may notice that your gums may bleed a little. This is normal and should stop after one or two uses. If bleeding persists stop flossing and consult your dentist or hygienist. There are many different products designed to make flossing easier - try them!